This powerful feature allows you to make exact copies of the entire disk (Drive Image), which can be used to restore the whole computer without having to reinstall the operating system and programs. The backup is done without interrupting any service neither the user's work (hot backup). Iperius Backup Desktop is a flexible and inexpensive solution for protecting any computer. You can create unlimited backup jobs, to save files to FTP or Cloud spaces (such as Google Drive or Dropbox), or any mass storage device (USB drives, external hard drives, NAS, etc.). Iperius is a very stable software that does the work accurately and without interrupting the user's work. Its many features - such as synchronization, compression, network authentication, installation as service, e-mail notifications - make it an highly configurable and useful software. 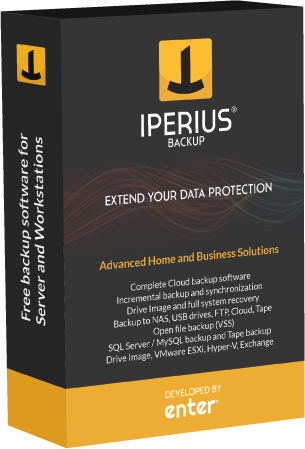 Finally, thanks to the perpetual license (no renewal cost) and the free support and updates, Iperius is certainly the most durable and affordable choice to backup and protect your data.